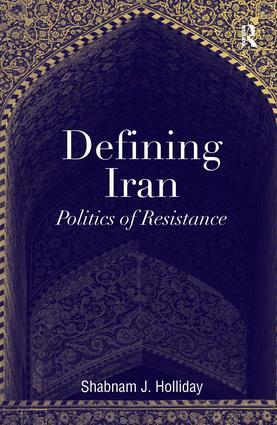 Defining Iran presents a new and revealing analysis of the way in which Iranian political discourses compete with each other by examining them within the framework of national identity construction. By deconstructing the intellectual roots and development of Iranian national identity, Shabnam Holliday advocates the need to study Iran's heritage and historical experience to understand key shifts and processes in contemporary Iranian politics. Holliday convincingly argues that competing discourses of national identity advocated by political figures from Musaddiq to the current administration demonstrate a politics of resistance to both internal and external forces. With a particular emphasis on Khatami’s presidency, this study compares the meanings attached by significant members of the Iranian political elite to concepts including Iran’s pre-Islamic heritage, Islamic heritage, civilization, 'democracy' and the 'West'. Furthermore, discourses of Iranian national identity exist not in isolation but rather as part of a continuous process construction and reconstruction in Iran's journey of political development; a process manifested so vividly in the revolution of 1979 and the fallout from the 2009 presidential election. Defining Iran simultaneously furthers our understanding of the conceptualization of national identity both generally and specifically in the case of Iran and political dynamics which shape contemporary Iran. Shabnam J. Holliday is Lecturer in International Relations at the University of Plymouth, UK.